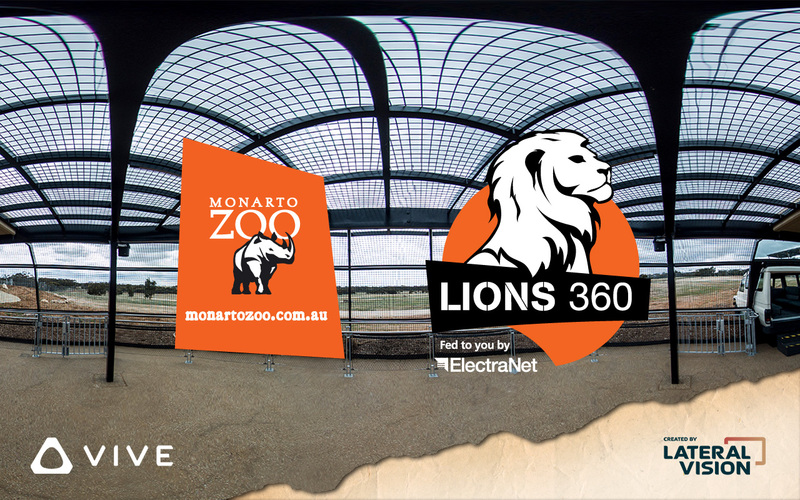 The Lions 360 experience at Monarto Zoo opened in late 2017 and is Australia’s only 360 degree lion encounter which gives you a prey’s eye view into the world of these awe-inspiring predators. To promote the attraction, Zoos SA sought to create a virtual reality experience using 360 degree video which could be set up for viewers in Rundle Mall during the promotion period and also shared online with YouTube vr videos. Lateral Vision captured a series of 360-degree videos at the lion enclosure during feeding time. Due to the timing of feeding and lion activity, the filming for this VR experience needed to be quick and unobtrusive. Our team built a custom VR experience for Zoos SA in which you can explore the Lions 360 enclosure and are then encouraged to book and visit the lions in real life. Our team used gaming techniques to create an interactive experience which combines 360 video, graphics, animation, gamification and audio to immerse users with the lions. The full VR experience will be available in Rundle Mall during a promotion period. Our friends at Untethered VR provided the hardware for the Rundle Mall experience. To allow wider distribution, the 360-degree video is also available to view on desktop, mobile and with all VR headsets on YouTube.